Video images are captured and shared using any Windows-compatible camera or video card. Fast video compression speeds images over the network. Video images you see can be stretched to any size giving the size of picture you want to see. You can also change image resolution at any time during your session. A feature not supported by any other video conferencing program. Send voice over the Internet using any Windows compatible sound card. It also supports full duplex sound cards. If it works in Windows it will work with Honey Q. For natural-sounding voice communication, Honey Q uses the software compression built into Windows or your sound card if it has hardware compression. Instant messages we call MiniMe's. It's great fun. Use your camera to snap a picture and send instant messages and to anyone on your online list. Files of any size can be transfered to all group members. Share a picture of the family. Transfer a map while describing directions. Show a chart, then make changes and download in real time. Does not rely on ICQ server to send those files. ICQ slow today? Use Honey Q instead. Draw figures using the line, oval, rectangle and scribble tool. Capture the video image of the person you are talking with. Copy and paste images from other Windows applications to share with others. Move the image around to position it more to your liking. When your all done save the image as a bitmap to the disk. You don't need the ICQ server once you're connected. You can even close ICQ, if you wish. Honey Q does not load the ICQ server in any way. Windows 95/98/2000/XP, 486-133Mhz or faster, sound card with michrophone, Internet connection through PPP or SLIP or local are network using TCP/IP protocol. Video for Windows video capture card or camera optional. 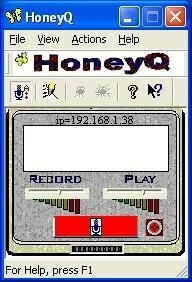 A copy of HoneyQ at both ends.